SPAIN: National Riot Police Beat Voters As Catalonia Secession Referendum Descends Into Chaos [VIDEO] - Joe.My.God. Catalonia’s disputed independence referendum was in chaos on Sunday, with reports of hundreds injured as Spain’s national police launched a widespread crackdown on the vote. Catalan President Carles Puigdemont condemned “indiscriminate aggression” against peaceful voters. Spanish authorities appeared determined to deny the vote legitimacy by preventing as many people as possible from casting ballots in the referendum, which Spain’s top court has declared illegal. Regional authorities said 337 people were injured after Madrid deployed the national police force to close down polling stations. Barcelona’s deputy mayor said police fired rubber bullets at people as they attempted to vote in the city, the regional capital. There were reports that police in Girona used batons. Videos show police dragging voters from polling stations by their hair, unprovoked attacks on protesters and Spanish police attacking Catalan firefighters. 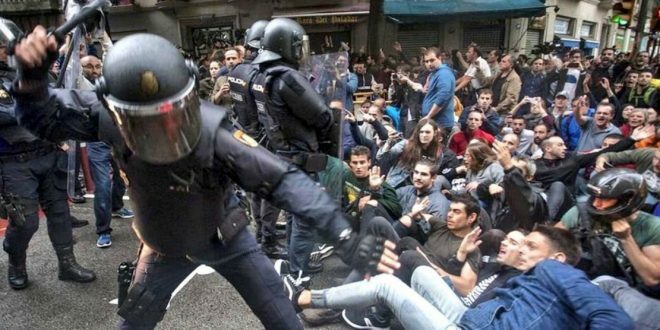 There have been several calls for the Spanish prime minister, Mariano Rajoy, to resign over the police response from Catalan politicians and opposition MPs. Barcelona’s La Liga fixture against Las Palmas is being played behind closed doors as a result of the disorder. They only wanted to vote. Spanish Deputy PM Santamaria says police actions today is to defend democracy and people’s freedom.